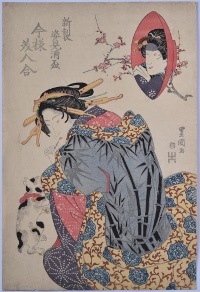 A courtesan with a toothpick and playing with a cat compared to the actor Iwai Hanshiro V ( inset in a sake cup top right ). 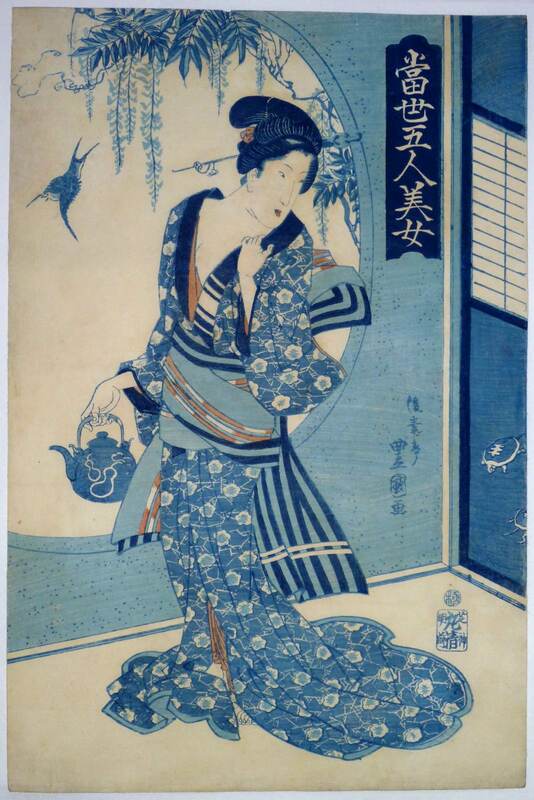 From a series Imayo bijin awase, shinsei sugatami sakazuki, “A Comparison of Modern Beauties – A New Mirror of Sake Cups.” Published by Imariya Ushizo, c 1820-24. Very good impression, colour and condition. Extensive mica added to the coat of the courtesan. Signed Toyokuni ga.
A vertical diptych of Shoki, the Demon Queller. The character originates from China being a deity from China’s Taoist pantheon. He is always shown with his scholar’s hat, large robe and boots, and usually carrying a sword with which he attacks oni. Images of Shoki were hung outside houses to ward off evil during the Boys’ Day Festival on May 5th. 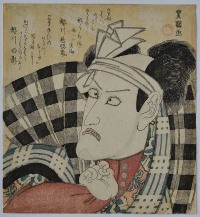 Published by Yamamoto Kyubei, c 1820. 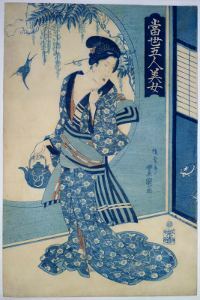 Prints by Toyoshige are often misattributed to Toyokuni I and vice versa because late Toyokuni I signatures and those of Toyoshige are similar. Rare. Very good impression and colour. Some edge soil, otherwise very good condition. Signed Gosotei Toyokuni hitsu. Evening Glow ( Sunset ) at Atami, Shizuoka Prefecture. 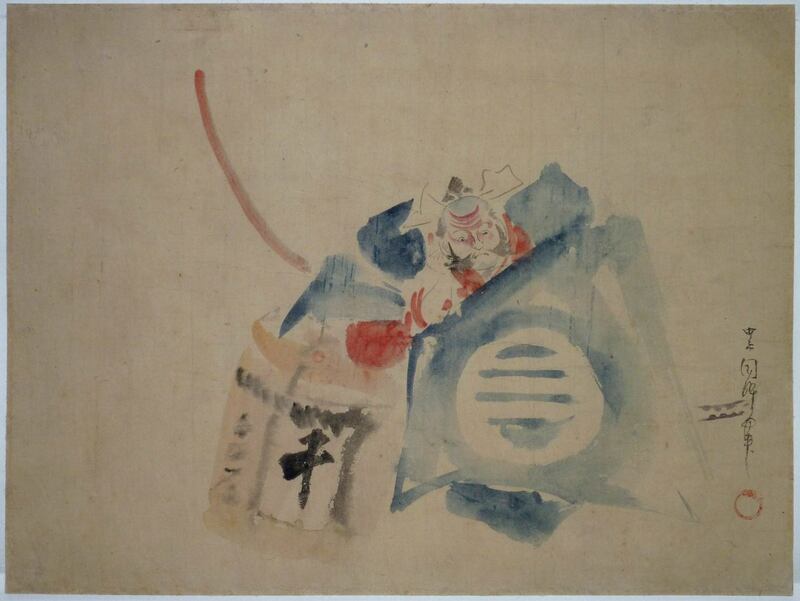 From a set Meisho hakkei, “Eight Views of Famous Places” ( based on the Eight Views of Omi theme ). Published 1830s by Iseri. The town is famous for the Onsen hot springs and the area is known for its past volcanic activity. Across Sagami Bay can be seen smoke coming from the volcanic island of Oshima ( the epicentre of the great Kanto earthquake of 1923 ). Fine impression and colour.There are two states of this set: one with square and one with cursive script ( as here ) in the oblong cartouche at top. It is unclear which is the earliest. This purple cartouche is often faded out to a puce colour. Slight centre fold otherwise very good condition. Signed Toyokuni hitsu. 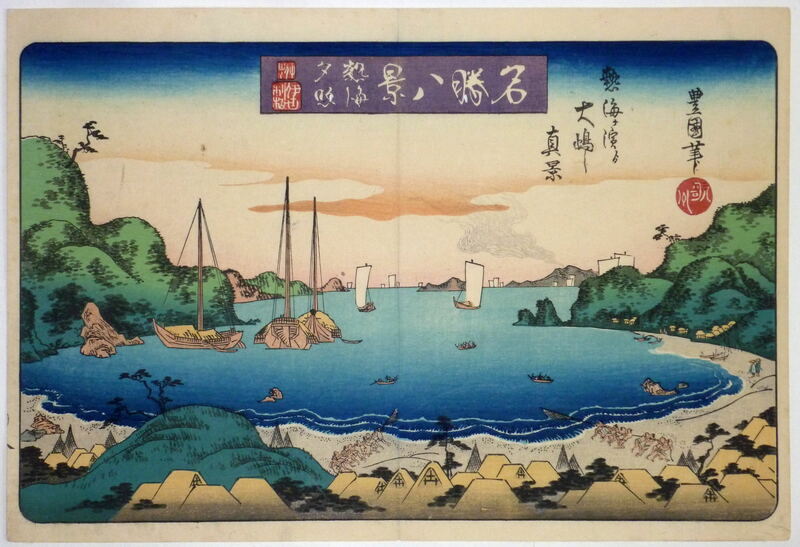 Clearing weather over the Enoshima Island from a Meisho hakkei, “Eight Views of Famous Places” ( based on the Eight Views of Omi theme ) set published 1830s by Iseri. A view of the island from Shichiri Beach in Sagami Province. The island was dedicated to Benten ( one of the seven gods of good luck ). Fine impression. There are two states of this set: one with square and one with cursive script ( as here ) in the oblong cartouche at top. It is unclear which is the earliest. Fine impression. Small expert restoration to two upper corners, otherwise fine colour and condition. Signed Toyokuni hitsu. 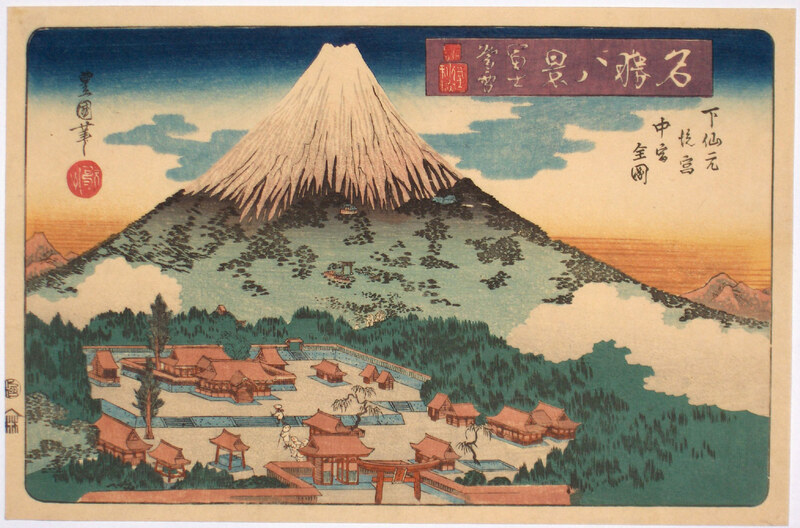 Fuji bosetsu, Evening Snow on Fuji from a set of Eight Famous Views published by Iseya Rihei, c. 1833-4. Fuji towers over a religious compound. 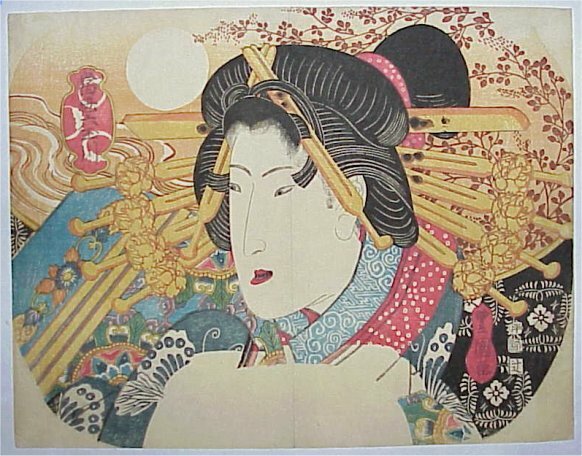 Toyokuni, like Kuniyoshi, Kunisada, Gakutei and Hokkei, while not known as a landscapes artist, produced a few fine examples, as here. Rare. Very fine impression and colour. Fine condition. The first edition: It’s not generally known that there are two editions with the title recut. Also, the purple colour in the title label invariably fades to a puce colour. Signed Toyokuni hitsu. A vertical diptych showing a tiger. A striking design published by Yamamotoya Heikichi c1820s. Fine early impression with gauffrage. Fine colour. Slight creasing and small edge repair, but otherwise very good, Full size. Signed Gosotei Toyokuni hitsu. A bust portrait of a beauty in the form of a fan from a series of the Six Tama Rivers, this being the Ide (or Hagi) no Tamagawa in Yamashiro. Published by Tsujiokaya Bunsuke with date seal 1823. Very fine impression and colour. Very faint centrefold. Signed Toyokuni ga.
A beauty standing beside a circular window with wisteria and a swallow, both symbols of spring. From an aizuri-e set Tosei gonin bijo, “Fine Modern Beauties.” Published by Maruya Seijiro, c 1830-5. Very good impression, colour and condition. Signed Gosotei Toyokuni ga. 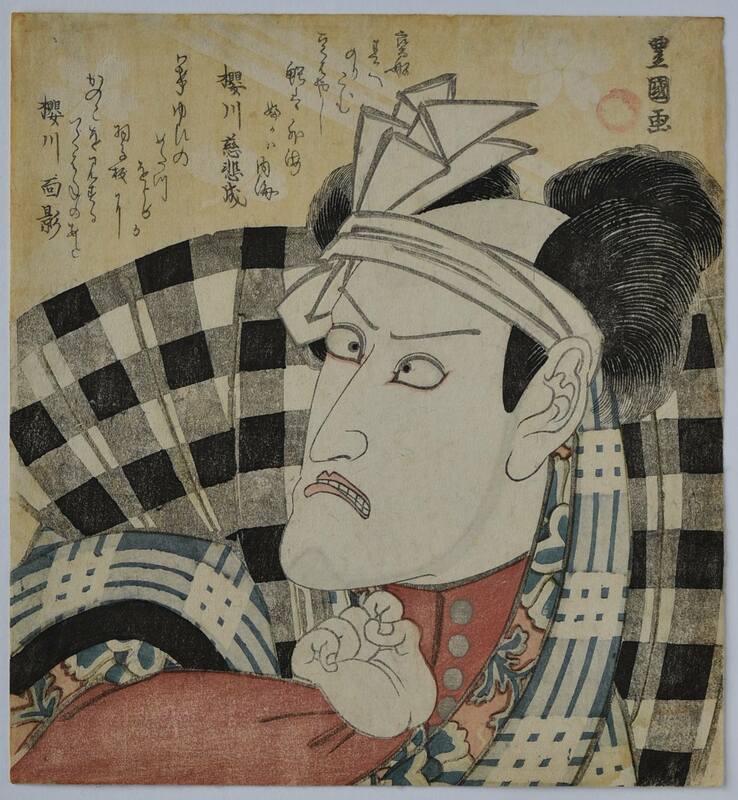 In the current update is a painting signed “Toyokuni painted while being drunk.” This is not an isolated example: Certain artists – such as Kyosai – often signed works in this way and indeed may have benefited from a degree of inebriation to prompt inspiration. 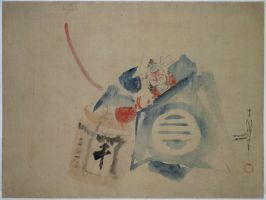 Artists often collaborated on works, especially of the Shijo school, and one can imagine the conviviality of such a cohors amicorum with food and wine being passed around. It’s difficult to think of a western comparison to this. Hand scrolls, because of their horizontal length and short height, were very suitable for joint efforts of like-minded artists or literati. The example in this update is spontaneous – even slapdash – due to the artist’s intoxication, but this adds a charm and veracity to the subject. 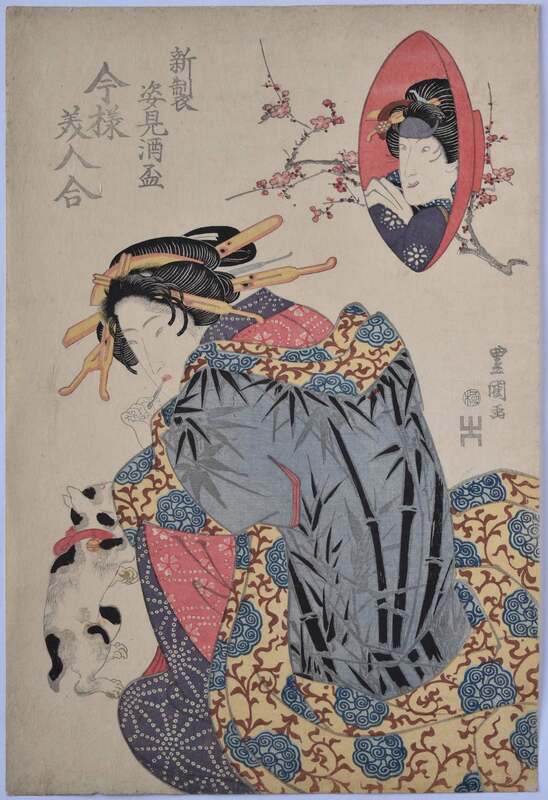 It also makes authentication easier, certainly of Ukiyoe subjects, as forgers tended to concentrate on copying the detailed, more sober and meticulous subjects, as these were the most highly valued. Japanese paintings are an undervalued area of collecting. 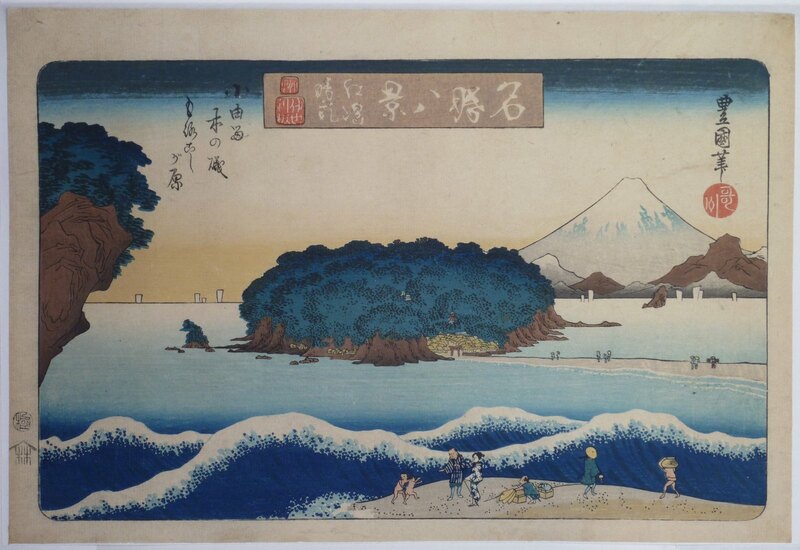 It’s possible, as here, to buy an important Hiroshige painting for the price many of his prints fetch. And one is purchasing an unique item.